BolognaFiere, the show’s producer, this year has mounted an expansion and reconfiguration of its exhibition center, and will be using Pavilions 29 and 30 for the first time. They were demolished and rebuilt in 10 months to add a reported 33,000 square meters of space—at a cost of what the company says was €45 million. Overall, the renovations in play to be completed in 2024 will cost €138 million and encompass 270,000 square meters of exhibition surface, the organizers say in their media messaging. African-American culture will be at the heart of “Black Books Matter: African-American Words and Colors” with an exhibition of Coretta Scott King Award winners spanning works of Afro-American authors and illustrators for 50 years. “Handwriting in Children’s Books” is a conference organized in collaboration with the think tank SMED, Scrivere a Mano nell’Era Digitale, on the comeback of handwriting, its pedagogical value, and the role it increasingly plays in picture books. In recognition of the strides women are making in many parts of the world and many parts of life, an event titled “Time Is On Their Side” will take stock of the trend toward women in children’s books and how they’re depicted. Another conference is titled “‘Toddlers: The Very First Books for Absolute Beginners, running in parallel to the Salaborsa Library’s show of literature for the very young. While other major trade shows in the world industry continue to add and expand their children’s and YA content areas and emphases, Bologna has retained its stance as the prime go-to event for youth reading, for rights trading in the sector and for analysis of current trends. In outreach, Bologna’s organizers point to the New York Rights Fair, which in its inaugural outing during BookExpo last year struggled to find its footing in a separate venue. This year, the rights fair—which is in essence BookExpo’s original rights trading center—returns to the Jacob Javits Center, May 29 to 31. In addition, Bologna will for a second year partner with China Shanghai International Book Fair to produce that event, November 15 to 17. The Swiss presence as guest of honor this year will focus on the market’s “ABC of Switzerland” exhibition, which is keyed on a letter of the alphabet being matched to each of the country’s 26 cantons. 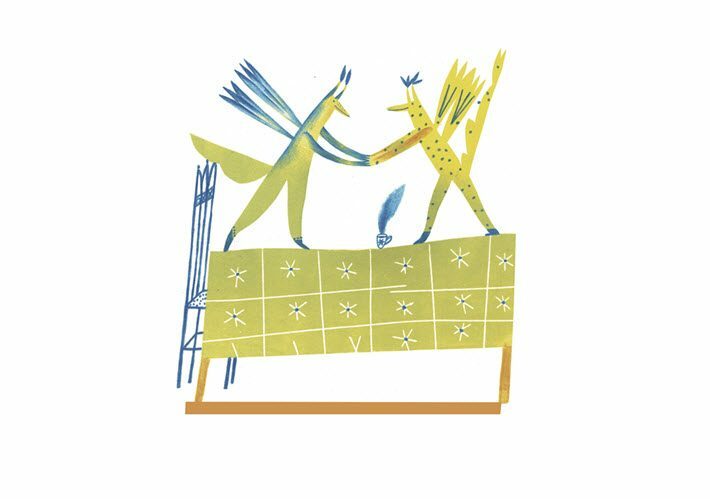 A jury has selected 26 illustrators, some among the best known of the profession in Switzerland and some still being discovered for their work. Expressing the cultural variety of the land, the chosen words are in all four national languages: Romance, Italian, French, and German, all translated into English for the international audience. 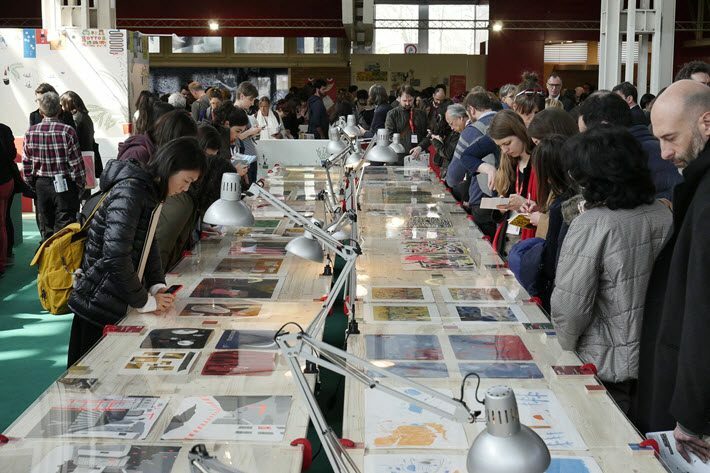 The show’s Illustrators Exhibition started with work of 2,901 illustrators from 62 countries for a total 14,505 plates submitted to be examined by a jury of five. The result is a show of 76 artists selected from 27 countries and region to be seen at the fair’s Service Center, staged for a third year with plates rearranged on horizontal shelves allowing visitors to walk around them and thus see them from the same perspective as the jury. 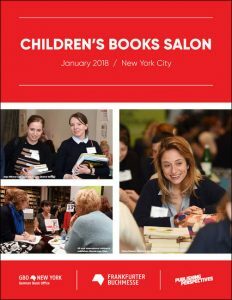 The International Children’s Booksellers Conference will focus on independent bookshops, on their role in the publishing industry and in the dissemination of reading among children and young adults. It’s co-organized with ALIR, the Italian Association of Independent Children’s Bookshops. The Bologna Licensing Trade Fair (BLTF), with its own site here, is back this year for a 12th edition, with somed 600 brands, available for the Italian, Southern European, and Eastern European markets. You can follow news from the Bologna fair at hashtag #BCBF19 . More from Publishing Perspectives on children’s books is here and more on Bologna Children’s Book Fair is here. Excellent article! I love the concept of illustrators pairing each letter of the alphabet to a Swiss canton and hope a future article will show us the results. One small copy edit for the four Swiss languages: please change ‘Romance’ to Romansh. Thank you.